Are You Ready To Grow Your Online Business By Tapping Into The Wealth and Depth of Web 2.0? You Already Know That YouTube, MySpace and FaceBook Are HUGE, But Do You Know What Is The Fastest Growing Web 2.0 Website On The Planet? Are You Using And Profiting From It? I was Skyping with my mentor recently about traffic, sales, trends and how we could stay in front of our competitors. My mentor is one of the most noted and highly respected marketers around, so you know I was really listening to everything on his mind. In fact, I'd go so far as to say that I was literally hanging on every one of his words. Let me be blunt, I'm no guru, but I am a fast learner. And if there is one thing that I have learned in my three years of being an internet marketer, it is that there is no reason to "reinvent the wheel". I have learned that if I can find something that works well, I can replicate it and make it work well for me. Good thing I was listening, because this conversation would soon change how I viewed internet marketing. Here's why... About 30 minutes into our conversation, I brought up the question of what he thought what was the most powerful Web 2.0 site around. Without hesitation, his reply was "Twitter". "Twitter?! ", I thought to myself, "Isn't that that site where people post little mico-blog comments about what they are doing?" Surely he must be mistaken! Fearful of admitting my own ignorance, I made up some lame excuse about needing to go and soon ended the conversation. After siging off, do you know what I did? Of course you do! I went and jumped right into Twitter-Land. I grabbed every resource I could find...I read all the Twitter-ish posts on the WF...I lurked among as many forums having anything to do with Twitter as I could...I went out and began teaching myself about what makes Twitter work and even more importantly why does my mentor think so highly of it. I even tweeted! :-) It was full immersion time! Along the way, I had a great conversation/interview with one of the 'nets foremost authorities on Web 2.0 social sites, Dr Ron Capps. Ron, aka the "Niche Prof" knows his way around Twitter and he agreed with me to make our conversation/interview known to anyone who wants to begin using Twitter to help grow their internet business. "Anyone who hasn't mastered what Twitter is and why they need to use it, should definitely read your interview." Thanks for an information-packed gem. 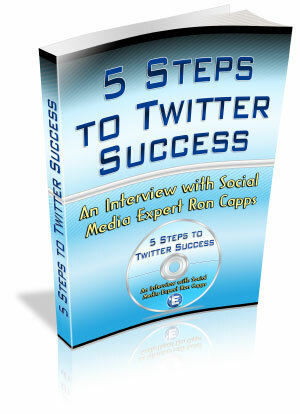 I've just finished reading "5 Steps to Twitter Success". You have pulled some great information from Dr. Ron Capps. This book has taught me new ways to use Twitter. Today, you can grab the contents of this power packed conversation in an easy to read pdf report! OK, so there is more than 5 steps... I told you it was a powerful interview! Are you wondering how much this valuable resource is going to cost you? Perhpas an even better question is, "How much will this cost my online business if I don't get on board with Twitter?" This report is easily worth $27 and that's for only HALF of the information you'll receive. But you won't have to pay $27. In fact, you won't even have to pay $17. AND...just to be sure that you hit the Twitter ground running, we've decided to sweeten the deal by adding this very special Bonus Product as well! So...Today you can pick up "5 Steps To Twitter Success" AND "5 MORE Steps To Twitter Success" for the unbeliveably small one time investment of just $9.97. Yup. Get BOTH of these "Twitter Must Haves" for less than 5 bucks each! The complete 2 Volume 5 Steps To Twitter Success package is yours to try to the fullest for the next 30 days after your purchase. Read and apply. Watch the results. I guarantee you will see Internet Marketing, using the power of Twitter, in a whole new perspective and sometimes wonder how the simplicity of things had actually eluded you. But if for any reason at all, you feel you didn't learn anything new or that it didn't help you, I'll refund every cent of your purchase - no questions asked. NOTHING TO LOSE... ALL TO GAIN! Go ahead, click on the link below and you'll receive an immediate download of BOTH these powerful Twitter resources for just $9.97! P.S. Don't forget: For only $7.99, you'll receive BOTH of the 5 Steps To Twitter Success products, yours to salvage for life. If you don't see the value in this, you must be crazy!